It’s finally fall! The temperature outside is getting cooler and the food inside is getting warmer. One of my favorite things to cook during the fall and winter months is soup. It’s hot, filling, and easy to make. 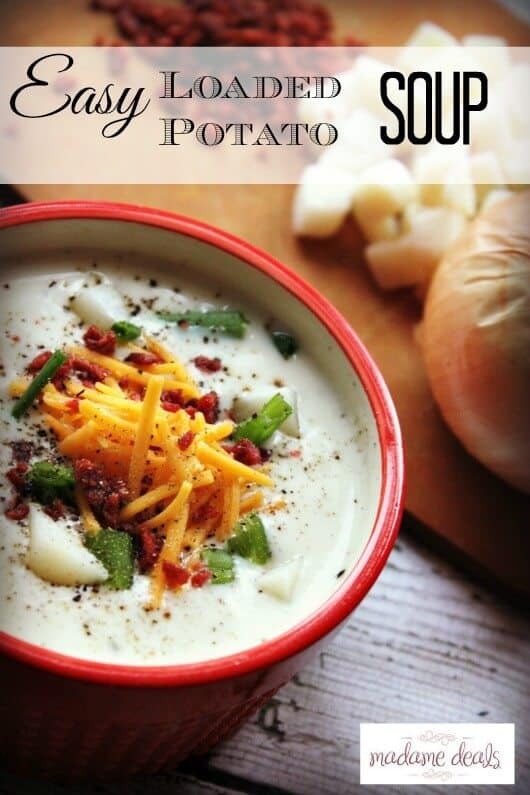 I have a long list of soups in my recipe book, but one of my favorite soup recipes is my easy loaded potato soup recipe! This recipe is nice and hearty and has great flavors. Most importantly it’s full of bacon and cheese, so really what else could you ask for in a great soup recipe right!? Step 1: In a large sauce pan melt your butter on Medium/High, once your butter is melted whisk in your flour. Step 2: Slowly whisk in your chicken stock. While stirring add in your sour cream and cream cheese. Continue stirring until combined and smooth. Step 3: Add in your frozen potatoes and shredded white cheddar cheese, let soup simmer for 20 minutes. Step 4: Pour soup into a bowl, top with shredded cheddar cheese, chopped bacon, chives, and salt and pepper, serve! It’s that easy, 4 simple steps and you have an amazing soup recipe that your whole family is sure to love. Another great thing about this soup recipe is that it freezes really well so you can save those leftovers! 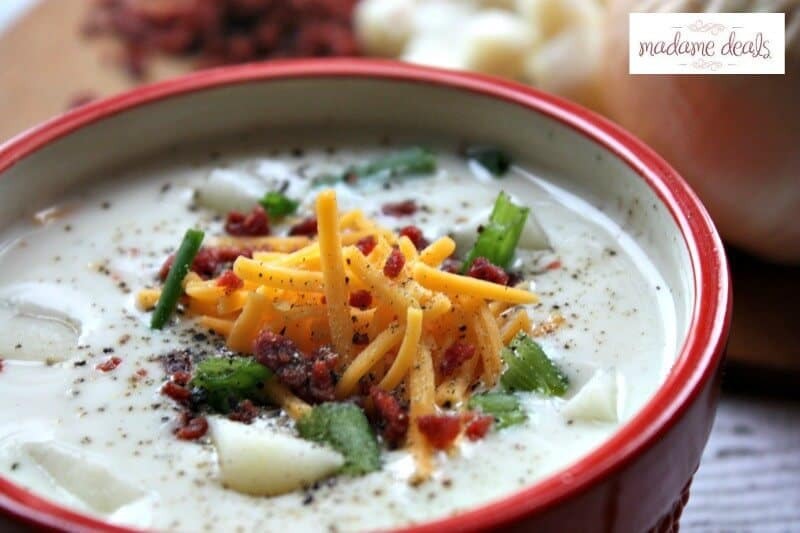 This Easy Loaded Potato Soup Recipe is sure to keep you warm and full during the cold fall and winter months! It's so Easy to make and freezes well. In a large sauce pan melt your butter on Medium/High, once your butter is melted whisk in your flour. Slowly whisk in your chicken stock. While stirring add in your sour cream and cream cheese. Continue stirring until combined and smooth. Add in your frozen potatoes and shredded white cheddar cheese, let soup simmer for 20 minutes. Pour soup into a bowl, top with shredded cheddar cheese, chopped bacon, chives, and salt and pepper, serve!